11.17.2005 - Yet another normal bat exclusion project, though I did manage to capture this nifty photo. I don't always have a camera with me, and even when I do, I often get wrapped up in my work and forget to take photos. Also, as is the rule, the best photo opportunities will always come when I have no camera. But this time I did, and I had a large swarm of bats swirling around me, trying to get back into a hole that I've blocked off. Although there's only ...ten bats in this photo, it seemed as though a couple hundred were swirling around me. However, bats are very peculiar when it comes to landing. They don't purposely fly right to a hole and dive right in. Instead, they circle and circle and circle. Then once they decide that they want to fly in, it often takes several tries to get it right. This of course depends on the architecture of the hole, but bats seem to need to approach the hole just right in order to get the proper momentum to enter, but not too fast that they incur injury. At least, this is my guess, because even when holes are wide open, they'll often approach, briefly land at the hole, then drop off only to try again. The situation is further complicated by large numbers of bats. It appears that once a bat has landed in the hole, that it briefly blocks the entryway, preventing another bat from swooping in. Then there's the whole matter of air traffic control. The bats don't want to collide mid-air, so they keep tabs on each other and approach with caution. Thus, even when you've got hundreds of bats such as in this case, they won't all fly at the hole at once. It's rare to get any photos of bats on the wing, and any shot with multiple fliers in the frame means a whole lot in the area. It was like a bat storm around me. This particular house had many holes, pretty much across the entire perimeter of the structure. This is not unusual. However, bats often adopt another odd behavior. Even when they've got multiple entry points, they'll often just stick to one specific spot. Actually, I don't know why I say this is odd. Every living creature does this sort of thing. I could enter my house through any number of doors or windows, but I always use the same door. I guess bats do the same thing. Why do the bats and I always use the same door? Because it's the best door. The very best, and no other door is good enough for my regal body to pass through, that's why. However, if someone boards up my favorite door, I guess I could use a different door. 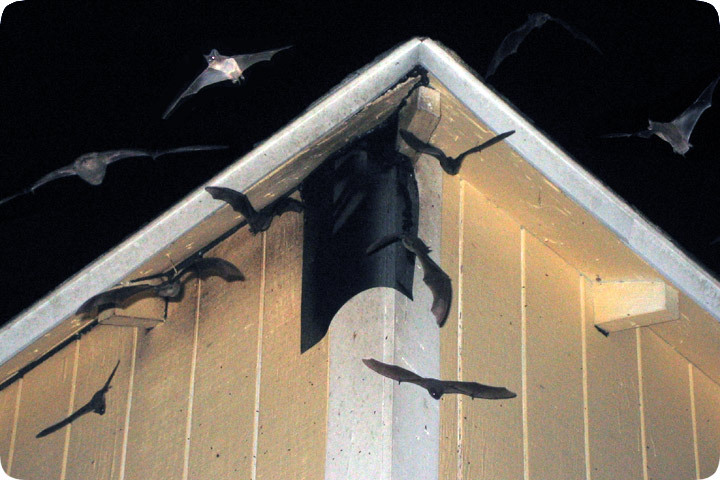 Bats will do the same, and that's why it's important to close every single possible spot on a house through which bats might enter, even if they're only seen flying in and out of one particular spot.